Last week we had a public holiday in Malawi. May 14 is “Kamuzu Day,” when the nation celebrates the life of its founding president, Hastings Kamuzu Banda whose autocratic rule lasted between 1964 and 1994. The day has been there since Kamuzu’s reign, during which it was celebrated as his birthday. This despite the fact that Kamuzu himself may never have known his actual birthday, owing to the fact that such events were not recorded around the time he was born. (He told everyone he was born in 1906 but most people reckon he was actually born eight years earlier.) This year was especially interesting for me because I have not been in Malawi on May 14 for the last ten years or so. Social networks were buzzing with Kamuzu nostalgia, newspapers published thick supplements on him and radio stations were jostling to outdo each other with their Kamuzu “specials”. But is the annual bonanza of tributes to the self-styled “Lion of the Nation” really about Kamuzu, or does it instead reflect anxieties about the failure of leadership since the arrival of multi-party democracy in 1994? And why is there no discussion of the kind of dictator he was? Kamuzu clearly loved Malawi as a country. He took advantage of generous development aid projects of the 1960s to mid 1970s that was aimed at helping develop former European colonies to fulfill his vision for the country. Most of such projects are still visible today. He built the country’s only international airport; hydroelectric power stations that his successors are struggling to upgrade; he built most of the roads that connects the country’s four cities; he oversaw the most competent, organised and disciplined civil service that Malawi has ever had; he built the University of Malawi (the one his successors are failing to run) and he built the two main referral hospitals that the country has. This is a foundation that sustained his reign of terror. Yet it is the same foundation that his successors could have easily built on when his regime finally fell in 1994. Like many sub-Saharan Africa countries that were doing away with their dictators in the early to mid 1990s following the end of the Cold War and with the end of Apartheid, Malawians demanded social, economic and political change. 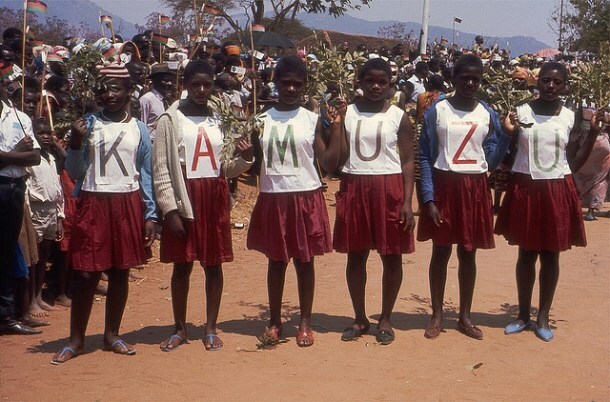 External and internal pressure forced Kamuzu to call for a referendum in 1993, giving Malawians a chance to choose whether they wanted to continue with his one party authoritarian rule or to adopt multi-party democracy. 64% of Malawians chose the latter. This led to a 1994 general elections where Kamuzu lost to Bakili Muluzi. Kamuzu was gracious in defeat; he congratulated Muluzi and wished him well before the vote count was over. Before his death November of 1997, the aged and frail Kamuzu made a public statement asking Malawians who suffered under his autocratic leadership to forgive him. It was an unprecedented and unexpected move. The once mighty “lion” had been humbled, it could no longer roar and it was now owning up to its brutal past. Malawi prides itself as a “God fearing nation”, so probably Kamuzu knew that these “God fearing people” would indeed forgive him, as their Bibles teach. Kamuzu tolerated no dissent or opposing views for the entire 30 years he was in office. If Malawi is indeed a “God fearing” nation then Kamuzu was second inline – he was a demigod to be feared and revered. Kamuzu created an inward-looking country, where he acquired this divine status that all his people were supposed to look up to. Anyone he felt was a threat to his “life presidency” was jailed, exiled or killed (Elliot reviewed the prison memoirs of the great poet Jack Mapanje a couple of years ago). Legend has it that he would feed some of those jailed to crocodiles. This cannot be verified but the rumour itself speaks volumes of a man Malawians today celebrate as a national hero worth shutting down national business for. On Kamuzu Day there were people sitting and watching in disgust as the nation celebrated as a hero the fallen despot that made their lives hell. This is understandable and I sympathise with the victims of Kamuzu’s dictatorship. Yet the point of celebrating Kamuzu Day is far more complex than celebrating his life. It is a leadership failure in Malawi that has created this day. It works as a kind of smokescreen, inhibiting critical engagement with our present as much as our past. Malawian politics is not about policies and there are no ideological fault-lines. It is about individuals outdoing each other. When politicians parade their attributes on a political podium, as they do, they are not only talking about themselves, they are contrasting themselves with their rivals. The formula is that of a beauty contest. In this game of personalities none of the Malawi leaders that have come after Kamuzu — Muluzi, Bingu wa Mutharika and Joyce Banda — can outdo him. He built infrastructure and could point to it, and they have not. Simply put: these leaders have failed to build on the foundation Kamuzu built. Consequently, these leaders have wanted to associate themselves with Kamuzu. If you cannot beat him, join him. Muluzi was slightly different probably because he was a direct successor. Yet he did his best to erase Kamuzu’s name, renaming almost everything that bore Kamuzu’s name. It was Mutharika who built Kamuzu’s lavish mausoleum at taxpayers’ expense. Yet in life Mutharika feared Kamuzu so much that he spent years in self-imposed exile during Kamuzu’s reign. After only one year in office, Joyce Banda has already renamed State House “Kamuzu Palace”. At the time of writing this piece, Banda was in Kasungu, Kamuzu’s home district, attending celebrations – wearing clothes bearing Kamuzu’s face. It is this kind of nostalgia that has compromised transitional justice in Malawi. Malawi could well be the only country that celebrates the life of its autocratic dictator. No wonder that the Machiavellian figure of John Tembo, Kamuzu’s long time right-hand man and overseer of many of Kamuzu’s policies, remains prominent in mainstream politics today as the leader of Kamuzu’s party, the Malawi Congress Party. He is the leader of opposition in parliament and though he turns 81 years old this September, he will still contest the presidency once again in 2014. Tembo’s political durability is in part down to the fact that the succession of failed leaders that have come after 1994 means his MCP is, not unreasonably, regarded as Malawi’s most successful ruling party ever. Yet the history of that party tells its own story about Kamuzu. The MCP was the party of liberation formed by a generation of freedom fighters, who were later to suffer under Kamuzu’s presidency. The founder of the MCP was the late Orton Chirwa, who together with his wife, Vera, was arrested by Kamuzu 1981. Orton died in jail in 1992; Vera was released at the turn of multiparty democracy in 1993. Until today the couple remain Africa’s longest serving prisoners of conscience. There have been some younger Malawians aspiring for leadership positions, including presidency. Unfortunately, some of them have already joined the hero worship bandwagon. As a way of justifying that the youth can also hold leadership positions, some of these younger aspirants are arguing that Kamuzu had the youngest-ever cabinet in the history of Malawi. Referring to his first cabinet, of 1964. Yet most of these yet aspirants forget to mention what happened next. Kamuzu got rid of all these young intellectuals and leaders, one by one, following the Cabinet Crisis of 1964. Notably Henry Masauko Chipembere and Kanyama Chiume were exiled, and Yatuta Chisiza, like his brother Dunduzu before him, was gunned down by security forces. This epitomised Kamuzu’s 30 years rule. In 1983 there was the well documented case of Mwanza murders where four MPs were killed for simply suggesting that Kamuzu was ageing therefore there was a need to start succession plans. Of course the courts acquitted Kamuzu and Tembo in the trial that followed multiparty democracy simply because the government was too inept. For the record, Malawi government has never won any high profile case since 1994 – and there have been quite a few. Tossing around Kamuzu’s name and image as a political tool is making Kamuzu into a heroic saint that bears little resemblance to the historical record. He was a ruthless authoritarian that caused a lot of pain to many people whose relatives and parents languished in jails, exile and some were killed without committing any crime at all. He ran a state without a justice system. He was the sole arbiter of truth. This is the side of Kamuzu that is slowly being erased from nation history, deliberately or not, and as we blur the lines of our past, it becomes more and more difficult to understand our present. Airbrushing Kamuzu’s legacy and creating false nostalgia that is only aimed at diverting the national psyche from current leadership failures is not only injustice for those that suffered during his reign, it also stifles national progress and development. Malawi will not develop if nostalgia and hero-worshiping are drivers of its leadership. The country needs visionary leaders ready for public service. Leaders with policies that can drive the nation forward; this has nothing to do with anybody’s age, gender or tribe. Here the electorate have a role to pay: look beyond personalities and focus on their policies instead.